This topic contains 79 replies, has 45 voices, and was last updated by Nosfaerin 2 years, 1 month ago. We’re going to release Alpha 5.3 (just an update during maintenance, hopefully no world wipe required) either later this week or the next. Among some improvements, I wanted to highlight one in particular: the gauntlet salvage mode will no longer damage attached ship parts. Excessive griefing has always been a danger with Worlds Adrift, since we allow players so much freedom. We prefer to combat it with more elegant solutions, but until we get there, preventing salvaging parts on a functional ship is something we can do quickly to negate these low-risk, difficult to defend tactics. As such, this is a temporary change that will most likely be reverted in Alpha 6.0, once we implement things like stacking respawn timer penalties, islands that don’t have revival chambers, etc. Going forward, there are going to be other griefing-related things that we’ll have to react to based on what you, our alpha testers, are telling us. But we don’t want to make knee-jerk fundamental changes to the game, especially before all the properly-designed mechanisms are implemented. So it would be really helpful if you kept an eye on this mechanic, and let us know how it plays – perhaps with the respawn improvements above, it would be better if the gauntlet simply did 25% damage on attached ship parts rather than 0% or 100%; or perhaps there should be a second stage of the gauntlet charge that only kicks in after being held down for a long time, that allows you to damage attached ship parts. We’re open to suggestions. 5.3 will also be another fix to help maintain creature populations, a fix to eggs never hatching, as well as (finally!) fixing clouds so they don’t cover entire islands. This one doesn’t really belong on a list of bugs, but it’s important enough to mention here: Random respawns will finally be fully implemented and work as intended, which is as a last resort when being spawn camped, rather than a way to bypass building ships. I think the salvage gauntlet change to 0% damage on ships is a step in the right direction. 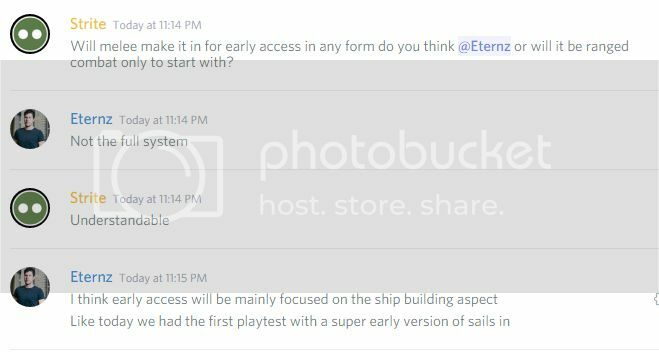 My suggestion would be to leave it at 0% if a ship is piloted at the moment, 25% if a ship is not piloted and not docked and 100% if a ship is docked in a yard claimed by you or your crew. The reasoning behind this suggestion is that I personally think its a bit unbalanced to be allowed to engage in combat and destroy stuff without any resource investment from the attacking side. If you want to attack a piloted ship you can either use cannons from your own ship or board with timed explosives (which could use a bit of a reduction in the fuse burning length). I am by no means against destroying other peoples stuff and want to avoid a carebare building universe at all costs, but i think there should be at least a small cost/risk attached if you try to mess with someone. @whoisthatguy, I second that, particularly because right now artillery combat makes little sense. A frequent combat scenario now is board the other ship, trash the skycores and watch her drop. This happens in seconds, way faster than doing the same with ship guns. So 0% damage to piloted ships makes sense, if you ask me. Less fog / clouds and anti griefing sounds like a fun time in the near future. However what will happen to abandoned ships as right now there are already a ton of abandoned empty frames everywhere with a few parts that cannot be fully removed and if this is removed entirely it will only get worse? Perhaps if all the sky cores are disabled on a ship you could remove all of it for resources and to clean things up a bit as this could take a decent amount of time on bigger ships thus harder to grief and to save on server resources and to clear land up. Make it so once the sky cores are disabled and removed you need to remove everything else and then the frame could be salvaged. Also once we get into the ability to have actual battles with cannons when this is done how will the victor be rewarded if everything drops to the void as what will be the encouragement to have these battles other then to simply fight? I am sure this is a ways off with other reasons to have battles such as defending valuable islands you can build bases on or other reasons but right now there is no reason to have them other then to grief or for testing purposes. I would like to see less salvaging of ships in flight and more the use of bombs/grenades for that. If your going to pvp, then pvp. If your going to just grief……yah, the salvage tool should not do much if any damage to a occupied ship. You Can have 5 folks defending a ship and still one person can tear through a hull with a salvager is not a good balance. They should have to use bombs, It takes some time to place the bomb, and I like that mechanic. What springs immediately to my mind is board the ship, grab what you can, then sink or damage her enough so that the enraged crew won’t follow you to teach you a lesson. In other words, be a pirate. The problem with salvaging being 0% on a developed ship, is you can’t break through the hull manually anymore in battles. There would be no more awesome boarding battles, as you’d have to go through a porthole, likely right in front of a crewmember, and your presence would be no longer Secret. I’d recommend changing the time it takes to salvage a working ship be quartered or take 4-6x as long as normal, but also salvaging working ship parts and frames should give off a loud “creaking” sound, extremely different from normal harvesting so that we know we’re being attacked. That way we can still have skill-based battles and have plenty of time to react as the victims. The gun definitely needs to be fixed for this to work though, and for those who fear griefers if this became a thing, get a gun and you’ll have plenty of time to kill him before he destroys anything on your ship. EDIT: or instead of changing the gauntlets salvage time back from the 0%, just make sticky Breach bombs a thing. That would allow for some tricky boarding, as you’d have to get away from it before it blew. The problem with salvaging being 0% on a developed ship, is you can’t break through the hull anymore in battles. I’d like to disagree here. Explosives exist, they can be used to break through a ship, they are not infinite, they can be lost on death if not equipped. I’d say all of that combined makes them a much more balanced thing for combat than the instantly ready, infinite and unlosable shipbreaker the salvager is in 5.2. EDIT: Yes, proper sticky bombs could be a good solution. @tk-313 I reread what I said, and I said it wrong. Wasn’t able to edit it before your reply. Sorry about that. Absolutely wonderful! Thanks Bossa for listening to us, I currently look forward to years of playing this game :). The gauntlet does damage to functional parts based on the percentage of the damage that exists to the part (or maybe even a percentage of that). * Griefer drops would not be as much of an issue, at 0% current damage their guanlets wouldn’t do anything to a ship. * Raid boarding parties would still be a thing though, cause if you land a cannon shot, then you have parts of a ship that can be salvaged. Of course, bombs would still be an issue to this one, but I believe they will have their own limitations? Raiding ship gets in cannon range, attacks and the cannon lands, damaging the ship. A raiding party could then board the ship and further damage those parts with salvage tool. So, if an engine was hit for 25% of it’s HP, then the raiding parties salvage tool would do 12.5% damage at first (50% of 25% original damage). If the raiding party is not stopped, then their salvage damage would increase until it this the 50% mark (and the part hits 100% damage). * keeping the tool appropriately useful in battle and for general part salve of abandoned vessels. Another wild thought: cutlasses anyone? I mean, pistols are useless without bullets, so if you urgently respawn to your attacked ship from far away, you can’t immediately take defensive action – you need to go to your hold, get some metal and craft some bullets first. Which is all extra time for the boarding party. A cutlass needs no bullets. And maybe (just maybe) it could cut ropes. On the down side, it can also be a perfect spawn camper’s weapon for the same reason, which makes me rather hesitant about this idea. Still, I just can’t not put it forward. And how it’s intended? I will cost knowledge, or cooldown 24h, or something else?